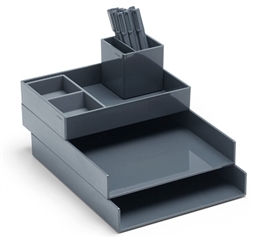 Keeping your dorm desk organized is pretty important. However, adding to your dorm room decor is pretty important too. Just because your dorm organizers for your desk are necessary, that doesn't mean that they can't be fun or add to your dorm room decor. 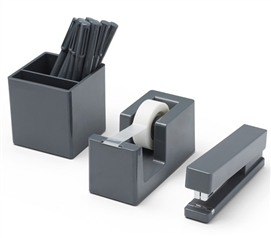 Here you will find our Gray Colorful Desktop Supplies. These dorm essentials will allow you create a matching look with your pen cup, accessory tray, and pens, or you can completely create a unique look by mixing and matching with our other Colorful Desktop Supplies. Your dorm desk is where you will be spending a lot of time. It's where your computer will be and it's where you will study and work on your homework. That being said, you need to keep that area clean and organized. 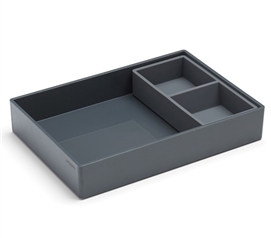 Our selection of Gray Colorful Desktop Supplies will help you keep your area looking great by keeping you organized and in a neutral gray color, you can even add to your dorm room decor!